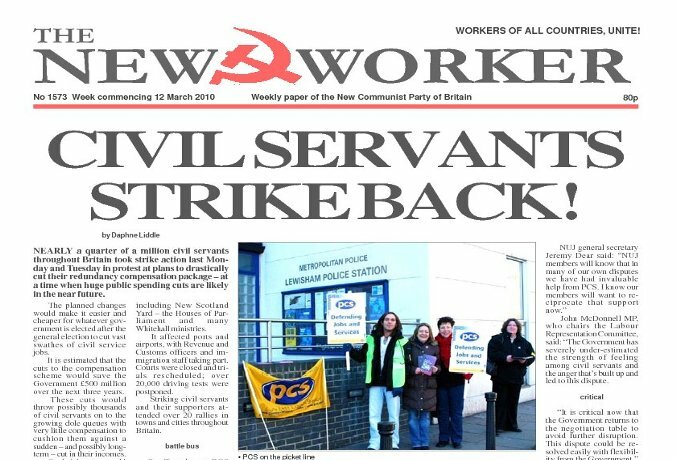 NEARLY a quarter of a million civil servants throughout Britain took strike action on 8th and 9th March 2010 in protest at plans to drastically cut their redundancy compensation package - at a time when huge public spending cuts are likely in the near future. The March 2010 Iraqi elections were, of course, a predictable farce that convinced no one in the Arab world that the puppet authorities have any legitimacy beyond that devolved by the occupying power. In Britain Labour is closing the gap in the opinion polls with the Tories, amid predictions from some of the media gurus of a “hung” parliament after the next election. What they actually mean is a Labour and Liberal Democrat coalition which is precisely what the pro-EU elements within the British ruling class want, because that is the only way that they will be able to take Britain into the euro within the foreseeable future.